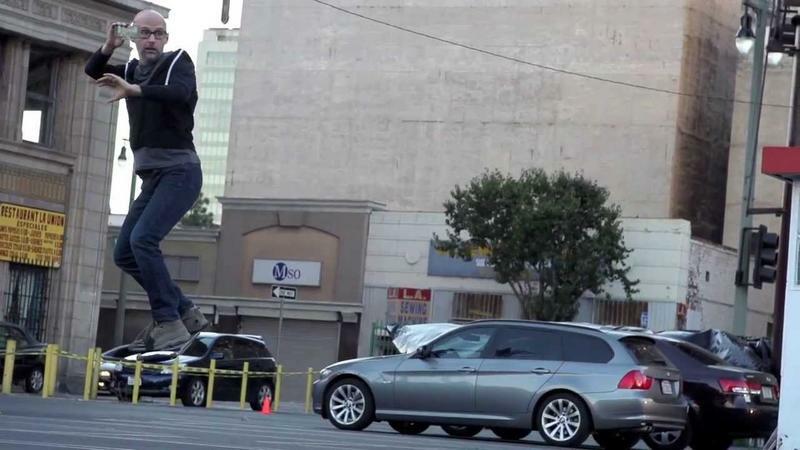 There was never any doubt that Back to the Future hoverboard video was fake. Physics, for one. But mounting evidence is slowly revealing who is being the nerdy ruse, and it's not Ashton Kutcher punking us. As bad as we want to believe hoverboards can exist in 2014, they don't, and HUVr Tech's claims are completely unfounded despite the fake company's website announcing "Yes! This is real!" After some digging, the always-reliable Internet found that Funny or Die is probably behind the prank, though it's still unclear what the point of all this is. Apparently Christopher Lloyd fessed up to doing a shoot with the Funny or Die crew last year, while costume designer, Lauren Beidenharn, listed a "HUVR BOARDS" commercial in her online portfolio for Funny or Die last November. Additionally, HUVr Tech's "lead engineer" is actually an actor, Nelson Cheng, whose reel you can find on his website. As if the video's celebrities being held up by harnesses wasn't obvious enough, this latest evidence should leave no doubt HUVr is one big hoax. A viral one at that, however—the video has amassed over 3 million views on YouTube already. The visual effects were certainly a good attempt, though. If Funny or Die is responsible for this video, I fail to see the funny side of it. I guess the joke is on whoever thought this was real. Just like the joke is on whoever believes Bigfoot is fake.